Ihre Social Media-versierten E-Mail Marketing Kunden haben genug in ihren Köpfen in diesen Tagen, ohne Ihre Kampagne mit dem Ernst der globalen Erwärmung oder des nationalen Defizit zu sehen. Etwas heiteren Spaß in Ihren Inhalt zu bringen kann Ihren Ansatz fördern und Kunden bringen. Die ersten Spionenschüsse aus dem Set des neuen Superman Film, setzte ein Internet Gerede um die Welt. Zum ersten Mal fehlte dem kryptonischen Mann aus Stahl seine rote Unterwäsche. Was für ein besserer Zeitpunkt, um den Verkauf von roter Unterwäsche zu fördern und Ihre Kunden zu ermutigen sie außerhalb ihrer Hose zu tragen, zur Unterstützung des traditionellen Supersuit? The various elements of your E-Mail Newsletter that are mandated by adherence to legislation and varying standards can shed the "Just The Facts, Ma'am" tone of an old Dragnet episode and be brought forward to The Big Bang Theory sitcom level of relevance. 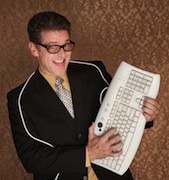 Even though legitimate email marketers have through years of effort amply differentiated themselves from spammers it can be fun or even shocking for your subscribers to see references to spam, maybe as a tongue in cheek repeating background or a winking reference to your competitors' email campaigns. This approach can be even more relevant to your Hawaiian subscribers as Spam is the equivalent of sirloin steak on the islands. Note that the Spam logo and label are copyrighted by Hormel so you'll want to make sure you're within fair use guidelines. You never know who will be the recipient of one of your forward to a friend emails so it's imperative to avoid offensive content. However, there are plenty of perfectly funny jokes which do not cross the line towards X-rated land which you can use to start off your email newsletter and encourage your customers to pass along. Have a brainstorming session with your staff and Google some good joke sites and you'll never be short of material. Get those comedy wheels turning and you'll revitalize your soporific Online Marketing campaigns! 5 Weisen wie Sie Ihre Immobilienanzeige Rundschreiben neu ausrichten.